Apple iOS 4.2 Update: Alarm Bug Fixed! Apple would be rolling out an update to the iPhone Operating System with certain bug fixes. iPhone users who have administered the delays while waking up would be happy to hear about the update. A generic problem which made the alarm go off an hour later than intended have made the iPhone users suffer a lot. Apple has confirmed about the forthcoming update on the iOS 4.2 software which would bring in bug fixes in the iPhone’s Operating System regarding the alarm clock function following the move to Daylight Saving Time across Europe. Apple has been registering complaints made regarding the alarms going off an hour later than intended since the Europeans have been asked to correct time after Daylight Saving was implemented over the weekend. The iPhone automatically adjusted the inbuilt clock to reflect the return to GMT, affecting alarms, which more than 70% percent of the people use to get up for work, were affected by a software bug that caused the alarm to go off exactly an hour later than the intended time. We’re aware of an issue related to daylight-saving time and repeating alarms and will deliver a fix with the iOS 4.2 software update this month. We suggest customers set non-repeating alarms for now, and reset after November 7 to resolve the issue. 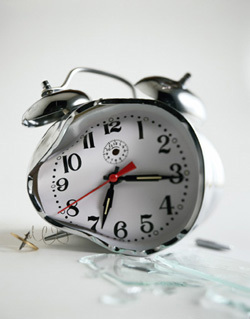 After Europeans, the US iPhone users are also expected to fall victim to the bug when their clocks change this weekend. First one to report on this problem were Australia and New Zealand last month, after the clocks were changed. While Apple is to roll out the update, iPhone users have asked to switch off automatic time zone adjustment on the iPhone and set the date and time manually instead. The iOS 4.2 software update is expected to be released next week. 2 Responses to Apple iOS 4.2 Update: Alarm Bug Fixed!